This is the final article in a four-part series examining Liquid Crystal on Silicon, LCoS, a relatively new and obscure display technology that is now making its grand entrance into the HDTV marketplace. Here in Part D we’ll start with an overall assessment of LCoS technology, followed by detailed technical performance comparisons between all of the major display technologies: CRT, LCD, Plasma, DLP, and LCoS. We’ll finish with a discussion of the most exciting new developments in display technology that will be the subject of future articles in this series. If you read Part A, then you can skip this Introduction. Already, LCoS provides the highest resolutions, the highest non-CRT Contrast Ratios, and the most artifact-free images of any display technology. For people that are sensitive to flicker and eye-fatigue, LCoS operates at the highest refresh rates (120 Hz) for the smoothest most flicker-free images. This article series is an in-depth examination of LCoS technology and five LCoS HDTVs, all but one of them prototypes, in order to get an early look into this unfolding technology. In Part A we started off with a description of the LCoS HDTV units that we tested, followed by an overview of LCoS technology. In Part B we continued with a discussion of How We Tested and then examined the photometry and colorimetry of the units in detail, which provides a quantitative assessment of their color and gray-scale accuracy. In Part C we began with a revealing Test Pattern analysis, followed by a description of the extensive Jury Panel testing and then provided individual Assessments for each of the units, including Jury evaluations and comments. Here in Part D we’ll begin with an overall assessment of LCoS technology, followed by detailed technical performance comparisons between all of the major display technologies: CRT, LCD, Plasma, DLP, and LCoS, and we’ll finish with a discussion of the most exciting new developments in display technology that will be the subject of future articles in this series. Note that these articles are the latest in a series of Display Technology Shoot-Out articles that have covered CRT, LCD, Plasma and DLP display technologies. The topics for the original series are: Part I: The Primary Specs, Part II: Gray-Scale and Color Accuracy, Part III: Display Artifacts and Image Quality, and Part IV: Display Technology Assessments. Online versions of these earlier articles are available on www.displaymate.com. Part D will draw extensively from the entire 7-part series. Caption: The Shoot-Out with the lights turned on. From left to right: JVC Consumer 720, Brillian 720, JVC Professional 1080, CRT Studio Monitor, eLCOS-JDSU 1080, and Brillian 1080 units. Photograph by David Migliori. ● LCoS is a reflection based display technology that can produce very bright high resolution images, which is essential for large High Definition screens (home theater and digital cinema) and also for high ambient light viewing. ● A true Contrast Ratio of 4000:1, the highest calibrated Contrast Ratio for all of the non-CRT display technologies, which means that LCoS produces very deep blacks. A fixed iris can further increase the Contrast Ratio by 50 to 100 percent or more. Note that Contrast Ratios reported for any display technology with a dynamic iris will be artificially raised because the iris has different settings for the Peak Brightness and Black Level measurements. ● LCoS easily handles HDTV resolutions of 1920×1080 and the technology is scalable up to even higher resolutions. JVC and Sony have already demonstrated 4096×2160 LCoS projectors and 12 mega-pixel devices are currently possible without requiring any new technology developments. ● Flicker-free images with refresh rates up to 120 Hz. The units all drive their panels at double the input signal frequency, which is 60 Hz in the US and 50 Hz in Europe. ● Uniformity tables correct for any variations in intensity or gamma within a device or between devices. Yields high uniformity in color and gray-scale across the screen. ● Very accurate Gamma Curves, Transfer Functions, and gray-scales with built-in factory calibration tables and measurements for each of the 255 signal intensity levels, which compensates for any device variations. Many of the panel driver boards currently operate internally at 12 bits. ● Very smooth CRT-like gray-scales that are free of false contouring due to the above. ● Dark images and dark gray-scales that are smooth and free of dithering noise as a result of the analog nature of the Liquid Crystal response. ● None of the units tested had any pixel defects. ● The highest pixel Fill Factors of all of the current display technologies (89 to 92 percent), which produces a very smooth picture with imperceptible gaps between the pixels. ● No noticeable deterioration with age. Most LCoS manufacturers claim device lifetimes of more than 100,000 hours. Fifteen years ago the CRT had a virtual monopoly for displays used in televisions and computers. Today we have half a dozen competing display technologies. In spite of all of this competition, the CRT has managed to hold onto its crown title as the Reference Standard against which all of the other display technologies are measured. There are two reasons for this: each new technology had to mimic the dominant CRT in order to be accepted in the marketplace; and second, the image and picture quality delivered by the best CRTs was simply outstanding and untouchable by any of the new technologies. Virtually all professionally produced content is still produced and optimized on CRT monitors. So, while all of the other technologies have been quite successful at chipping away at the CRT’s total market share, it has managed to hold on to the very top-end of the market and continue on as the Reference Standard for image and picture quality. But its lead has been steadily slipping and we’ll review its current status here. Below we compare the state-of-the art for each of the display technologies, based upon the best consumer and commercial grade units available today, regardless of price. Most of the comparisons are based on the in-depth and comprehensive testing and analysis that we performed in this 7-part Display Technology Shoot-Out series. Because the state-of-the-art is always changing (although not as much as the manufacturers and published specification sheets would have you believe), we’ve also taken into account evaluations and observations of newer shipping units and product introductions at tradeshows. In Table 1 we compare all of the technologies side-by-side: CRT, LCD, Plasma, DLP and LCoS. We’ve compared the technologies in 15 categories. No technology comes even close to wining in every category, but there are definite performance trends. DLP appears twice: in 1-Chip configurations, by far the most common, which currently use a spinning color wheel, and 3-Chip configurations, which are currently found only in high-end front projectors. LCD also appears twice: in Direct View and Projection. Each entry is an evaluation based on a letter grade system, with A for excellent, B for good and C for fair, with pluses and minuses added to indicate differences where needed. Some entries have two grades listed, together with a keyword suggesting the source of the duality. Each are explained further below. They are also visually color coded: A is green, B is yellow and C is red. They are all judgment calls based on my own measurements and detailed evaluations. Manufacturers are likely to question or challenge some of them, but I have no affiliation or vested interest in any of the technologies, so they are as objective a set of observations as you’re likely to find. We are going to cover a lot of material here, so we’ll only be able to briefly explain the meaning and interpretation of each of the entries in Table 1. For in-depth definitions, explanations and interpretations please refer to all seven of the Display Technology Shoot-Out articles, which are the foundation of virtually all of the material discussed here. Peak Brightness is important only for high ambient light applications. It’s overrated since most displays are already too bright for their intended application. The excess brightness can actually be put to good use by trading it in for improved contrast, gray-scale accuracy, and viewing angle. Peak Brightness for Plasma displays is significantly reduced when there is a high Average Picture Level due to limitations in power dissipation. Screen Brightness indicates how well a display can operate in low ambient light with lower brightness levels. An iris, backlight or lamp control is desirable to optimize screen brightness, otherwise the Contrast Ratio is reduced and Artifacts increase (when using the Contrast Control to reduce screen brightness). Black Level is very important for low ambient light and not very important for high ambient light. Brightness and Black Level determine the Contrast Ratio. The additional enhancement from an adjustable or dynamic iris is not part of these ratings. Contrast Ratio is very important for low ambient light and not very important for high ambient light. For projectors the indicated Contrast Ratio can generally be further increased by 100 percent or more by constricting the optical path with an iris, which reduces brightness and the overall optical efficiency (lumens per watt). The additional enhancement from an adjustable or dynamic iris is not part of these ratings. Plasmas are again affected by the Average Picture Level. Checkerboard Display Contrast is highest for the direct view LCD and Plasma displays. Plasmas are again affected by the Average Picture Level. CRTs and projectors have lower values due to the amount of glass in the light path. Checkerboard Contrast has only a minor effect on perceived picture quality (see the discussion in Part B). Color Primaries indicates how easy it is to adjust the primary colors for a given technology. It’s easiest for projection optics, but harder to change the sub-pixel filters in LCDs and the phosphors in CRT and Plasma displays. Drive Electronics indicates how capable the electronics is in producing artifact free images with accurate gray-scales, and in compensating for irregularities and limitations in the display devices themselves. DLP and LCoS have very sophisticated electronics that contribute significantly to their performance. CRT analog electronics is excellent in professional units but is frequently lacking in consumer and commercial units. LCD and Plasma have the most to gain in enhancing their drive electronics. Gamma Curve Transfer Function indicates how accurately displays follow the ideal power-law gamma of 2.20 via Drive Electronics and calibration. LCoS is the best because all 256 signal levels are measured and adjusted to match the ideal relation. Other technologies lack this detailed calibration or are pushed for peak brightness instead of gray-scale accuracy. Modern CRTs require some signal processing to deliver the ideal gamma. Gray-Scale Contouring arises from irregularities in the Gamma Curve, which introduces false intensity steps and visible contours in an image. Gray-Scale Dark Artifacts: the dark-end of the intensity scale is especially difficult to generate accurately, often leading to all sorts of irregularities. Temporal Dithering due to Pulse Width Modulation produces visible screen noise at low intensities for Plasma and DLP. Motion Artifacts include any form of smear, flicker or breakup when the image is changing. This can be caused by limitations in the drive algorithms, processing or electronics in addition to device latency. Viewing Angle artifacts arise from undesirable variations in intensity, contrast or color with angle. LCDs have improved significantly. Low gain projection screens perform much better than high gain screens that are used to boost screen brightness. Aging refers to a change in performance over time. Replaceable lamps in projectors are not considered aging here. The backlight in many Direct View LCDs is difficult to replace. The phosphors in CRT and Plasma units may age non-uniformly, but this is currently not a serious problem (See Part IV). LCoS and DLP devices do not deteriorate noticeably with age (based on lab testing as well as actual field use over 60,000 hours). Peak Resolution is highest for LCoS. CRT peak resolution is affected by Other Artifacts. Other Artifacts: although CRTs have the longest list of Other Artifacts, their primary effect is a softer image, which is sometimes desirable. The Color Wheel in 1-Chip DLPs can cause rainbows to appear occasionally but it depends on the image and sensitivity varies from person to person. Many DLP projectors double the screen resolution by using a dithering process called Wobulation. Now that we’ve discussed all 15 parameters and categories, it’s time to consider which display technology currently offers the best overall image and picture quality. The winner should be crowned the Reference Standard. To come up with an Overall Grade and Overall Rank we need a scheme to appropriately weight all of the entries. Because there are so many diverse applications for displays, even for HDTVs, no single weighting scheme is appropriate for everyone. Readers are encouraged to apply their own weightings based on their particular applications, interests and personal biases. For example, in high ambient lighting conditions, the C grades received by LCDs for Black Level and Contrast Ratio are irrelevant, and should receive a low weight, possibly even zero. On the other hand, in a high-end Home Theater, those parameters are very important and might receive the highest weights of all. A generic approach for the Overall Grade is to take a straight unweighted average of all of the individual grades. For general applications, it turns out that the end result is relatively independent of the weighting scheme because there is a fair degree of consistency in the grades for each technology. LCoS received almost straight As, the CRT got mostly As with some Bs and Cs, DLP received an even mix of As and Bs, both LCDs got mostly Bs with some As and Cs, and Plasma got a relatively even A to C distribution. With that point of view I came up with the grades and ranks shown in the table (which are relatively close to the unweighted averages): LCoS got an A and Rank 1, close behind was the CRT with an A- and Rank 2, DLP got a B+, and Rank 3, with a slight advantage for the 3-Chip over the 1-Chip. Plasma and both LCDs received a B, and tied for Rank 4. They are simply too close to call for general applications, but any specific application will most likely favor one significantly over the others. And the winner is… LCoS, the new Reference Standard for overall image and picture quality, dethroning the CRT after more than 75 years at the top. An impressive achievement for a technology that has only recently started shipping in quantity. The new display technologies have now moved out from under the shadow of the CRT to stand on their own accomplishments. For the time being LCoS has only a tiny overall market share in comparison to all of the other established display technologies. 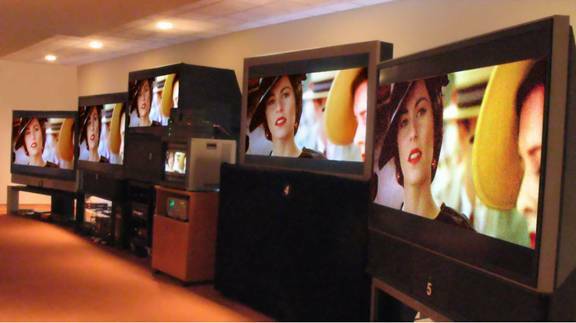 However, LCoS is likely to have an immediate impact at the top-end of the professional market, with the reference monitors that are used in television and movie post-production studios, particularly with the switch to true High Definition content and digital cinema. The undisputed leader up until now has been Sony’s Professional Trinitron CRT monitors, which are found in just about every major studio. A side-by-side comparison with the JVC Professional LCoS monitor would have been really interesting. We invited Sony to send one of their flagship Professional CRT monitors for a side-by-side Shoot-Out with the JVC Professional LCoS monitor, but Sony (again) declined to participate. Both units are well matched and cost around $45K. The performance of these Sony monitors is well known so it was easy to perform a virtual, in absentia, Shoot-Out by relying on my prior experience with these monitors (and with an eye on Table 1). In terms of image and picture quality, color and gray-scale accuracy, pixel-to-pixel sharpness, and freedom from artifacts, JVC Professional’s 48 inch LCoS Reference Monitor (DLA-HRM1, $45K) with true 1920×1080 resolution easily outperforms Sony’s flagship BVM 32 inch Professional CRT monitors (BVM-D32E1WU or BVM-A32E1WU, $42K plus plug-ins). The darker black level generated by the CRT is not an advantage in a studio because they intentionally use a low (but not completely dark) level of ambient lighting for production work. So the difference between the extremely dark black of a CRT and the very dark black of an LCoS monitor is not visually apparent. LCoS has been such a difficult technology to master that it now has more advanced processing and calibration tools and procedures than any of the other display technologies. That certainly gives LCoS an edge for now. With a comprehensive and fully automated factory digital calibration system that depends only on computer data processing, and with results that are digitally downloaded to each HDTV, it’s clear that the photometry and colorimetry issues that reviewers, calibrators and videophiles deal with today are going to go away in the very near future. In fact, with a small amount of computer processing in the LCoS driver boards it will be relatively easy for the set to recalculate the factory device tables real-time for any user specified color temperature, primary chromaticities and gamma – and to do so with very high accuracy, including color and gray-scale tracking (because the tables are already operating at 12-bits). So consumers will be able to easily specify their exact parameter preferences and the HDTVs will also be able to easily reconfigure automatically to any SMPTE or ITU standard. For situations where you want to squeeze extra brightness from an HDTV, the device tables can again be easily recalculated to allow for a higher color temperature and a specified amount of gray-scale compression near peak white (which could be implemented as an Overdrive Control). With this approach the incompatibility between the retail showroom and home theater calibrations will simply cease to be an contentious issue. With pricing pressures it’s likely that many manufacturers will none-the-less cut corners in the calibration process. Even with fully automated procedures, low cost manufacturers will feel pressed to save development time, equipment costs and manufacturing line time, all of which affect time-to-market and their manufacturing costs. Presumably that won’t be much of a factor for the higher-end units that many readers are likely to consider. It’s also clear that many manufacturers don’t yet understand the many subtle quantitative colorimetric and photometric measurement and data reduction issues that are necessary for accurate numerical calibration. Another related issue is that dealers and calibrators will not have the very specialized and expensive calibration equipment and access to the proprietary (secret) factory optimization and calibration software necessary to do the most important low-level device board calibrations. The next question is what is likely to happen in the near future? The competition is intense and all of the technologies will continue to improve, and they will certainly respond to the new challenges from LCoS. One reason why LCoS is doing so well now is that it was a very difficult technology to perfect, so its drive electronics is the most sophisticated of all of the display technologies, allowing very accurate unit calibrations at the factory to overcome limitations in the display devices themselves. The other technologies would benefit from a similar approach. Plasma and LCD have the most to gain from improving their electronics up to LCoS standards. The payoff there is very big return for a modest investment. So I expect that within a year or two many of the entries for the other technologies will show a marked improvement and close their gap with LCoS. It should be interesting to watch. What is really exciting is that we are about to enter an era where quantitatively accurate HDTV colorimetry and photometry will be the rule rather than the exception. Of course, there is still plenty of work to be done and plenty of room for improvement. Black Levels and Contrast Ratios, for example, need to keep getting better, the resolution for consumer units will eventually rise to 4 mega-pixels and beyond, but the most important factor that will differentiate display technologies will be their image artifacts (which were discussed here and in greater detail in Part III). While it seems likely that LCoS will hold an edge in many of these areas for the near future there's plenty of competition approaching on the horizon. While this is the last of the LCoS articles, the Display Technology Shoot-Out series will be continuing in the near future with articles on a number of exciting new display technologies. They will continue to be in-depth display technology assessments rather than product reviews. Potentially the most interesting is the Canon-Toshiba Surface-conduction Electron-emitter Display, SED, which is a very thin (under 1 centimeter) CRT-like phosphor based display technology. It has digitally addressed pixels, however, the brightness of each pixel is produced through an analog process, so it should be free of the digital artifacts that are present in Plasma and DLP displays, which have digital on-off intensity controls produced with Pulse Width Modulation (see Part III). In this regard SED is very similar to LCoS. As an emissive technology, SED already produces CRT-like Black Levels, with Contrast Ratios in the 10,000 to 100,000 range (much better than Plasma because it doesn’t need to maintain a background level for priming the discharge). The response time is speced at 1 ms, which is very fast. SED is a type of Field Emission Display, FED, another difficult technology that has been under development for over 15 years. The SED products were initially announced to ship in 2005, but that date has been repeatedly pushed back. The most recent announcement as of March 2006 is for a product launch at the end of 2007, with volume shipments to begin in 2008. That’s disappointing but typical for a new display technology. The SED prototypes that have been periodically shown since 2005 are very impressive. Canon has so far been very skittish about allowing us to test any of their SED prototypes, but with the current schedule we’ll be able to evaluate an early production unit by the latter part 2007. There are a whole series of very exciting display technology developments based on LED lighting for (front and rear) projectors and direct-view LCD panels. The extended color gamut that is possible with LEDs seems to be getting most of the attention. But as we have pointed out in Part II and Part B, an extended color gamut is undesirable for HDTVs because the primary colors need to match the standard Rec.709 primaries, which are used for color balancing all professionally produced content. If you have an HDTV with an extended color gamut you’ll see inaccurate gaudy colors. Two important advantages of LED lighting are their very long lifetimes and their long-term color stability. The UHP lamps used in most projectors have a spectrum and an arc profile that change with age, so brightness, color accuracy, screen uniformity and Contrast Ratio all vary over the life of the lamp. LEDs are immune from all of these effects. You’ll also save money by not buying the relatively expensive replacement lamps. But the most amazing advantage of LEDs is that they can be pulsed at incredibly fast rates. This strobing can be used to cut down on visible motion smear in LCDs (Part III) and improve the Contrast Ratio. For DLPs it can dramatically reduce dithering artifacts (Part III), dispense with a color wheel, and best of all eliminate visible rainbow artifacts (Part IV). Both of these developing technologies will be fantastic candidates for future Shoot-Out articles. We will be evaluating them at the appropriate time in the near future. LEDs can also behave like a super-fast dynamic iris, so they can dramatically improve Black Levels and Contrast Ratios (but with constraints that generally introduce some gray-scale artifacts, Part B). There’s still more… by using a very large number of addressable LEDs for backlighting a direct-view LCD panel, it’s possible to produce a display with an incredibly large Dynamic Range with reduced artifacts. For example, with a 1000:1 Contrast Ratio LCD panel illuminated by LEDs with a duty cycle range of a 1000:1, it’s possible to produce a display with a 1 million:1 Dynamic Range. BrightSide Technologies and Sharp are each developing displays with values of 200,000 and 1 million, respectively. We plan on evaluating them at the appropriate time in the near future. If you know of a technology or product that is appropriate for a future Display Technology Shoot-Out article please let us know at dtso.info@displaymate.com. The Shoot-Out articles appear in select publications worldwide. Over 75 people were involved with the LCoS Shoot-Out: about half were participating manufacturers and the other half were Jury Panelists (Part C) that came to evaluate the HDTVs. Special Thanks: A number of people made important contributions that warrant a special mention: special thanks to Dr. Edward F. Kelley of the NIST (National Institute of Standards and Technology) for many interesting discussions and for generously sharing his expertise. Special thanks to Dave Migliori for his excellent photography of the Shoot-Out with its difficult lighting layout and viewing angles. Special thanks to Stacey Spears for selecting and assembling the Windows Media Video program material. Special thanks to Julia Soneira and Lauren Soneira for helping to produce the Shoot-Out, which turned out to be a much larger operation than I had anticipated. And finally, very special thanks to Hope Frank (Brillian), David McDonald (eLCOS), Terry Shea (JVC Consumer) and Rod Sterling (JVC Professional) for the tremendous amount of work that they put in coordinating their company’s efforts, which was crucial for making the Shoot-Out a success. Equipment Manufacturers: Anchor Bay Technologies: Gary Chappell, Adam Damico. Gefen: Hagai Gefen (President), Linda Morgan, Khasha Roholahi. CinemaQuest: Alan Brown (President). Konica Minolta Instrument Systems Division: Tom Kwon and Maria Repici. Microsoft Windows Digital Media Division: Amir Majidimehr (Vice President), Stacey Spears, Kevin Unangst. Silicon Optix: Gary Chin, Ney Christensen, Dennis Crespo, Darren Gnanapragasam, Justin Lam, Gopal Ramachandran, Derek Yuen.